The Haddam-Killingworth Youth Soccer League is open to all Haddam and Killingworth children in the 1st through 5th grades. 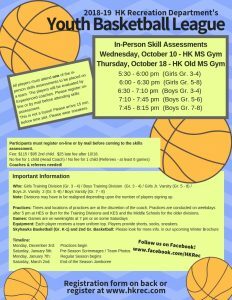 All players must attend the skills assessment in person. It is not a tryout. All players who attend will be placed on a team. Fee: $115 ($95 2nd child). No fee for head coaches (1 child). Free for referees who referee at least 6 games (1 child). We need coaches & referees – please help! Registrations are not guaranteed if received after 6/27. There will be a $25 late fee if we are able to find a spot after 6/27. On-line registration is available! Please go to our registration page. Participants must register on-line or by mail before coming to one of the skills assessments. The players will be evaluated by UKI Soccer Coaches. Please arrive 15 minutes before your assigned time slot to check in. This is not a tryout. All players need to report ready to play. Please wear cleats and shin guards. Bring sneakers or indoor soccer shoes if moved indoors. Please note: Divisions may have to be realigned depending upon the number of players signing up. Practices: Times and locations of practices are at the discretion of the coach. Practices are usually conducted on weekdays anytime between 5 & 7 pm at various fields. Games: Pre-Season and regular season games are played at the fields listed above on on Saturdays (rain date Sundays pending field availability). Equipment: Each player receives a team uniform top. Players provide shorts, soccer socks, and soccer shoes. Shinguards are mandatory. We recommend that each child have their own soccer ball, with their name on it. Grades 1 – 5 uses size 4 balls. Please contact us if you you interested in sponsoring a 2018 team. 1. There will be no refunds issued once registration is completed (after June 27, 2018). Exceptions will be made if a player is ill or injured (doctor’s note required), or if the player moves out of town. 2. It is understood that players are expected to be at their team’s practices and games. If a player will be late or unable to attend, the coach should be notified beforehand. 3. We will try to honor your carpool request (1 player), but we cannot guarantee this. Balanced teams are our first priority. Requests must be for carpooling purposes only (i.e. someone from your neighborhood). 4. You may pick one (1) day of the week that you do not want your child to practice. We will try to honor your request, but we cannot guarantee this. 5. Parents are expected to act in a sportsmanlike manner when watching games. Abusive language and behavior directed towards players, coaches, and referees will not be tolerated. 6. Once teams are selected, players cannot be moved to other teams. 7. I understand that my child is not allowed to wear any type of jewelry to games and practices. This includes cloth/plastic bracelets and, most importantly, any PIERCED EARRINGS. 8. I have read the concussion awareness sheet. 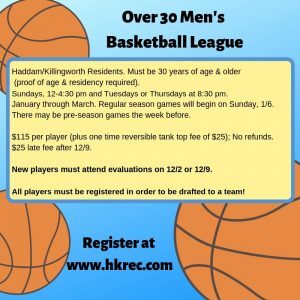 The Haddam-Killingworth Youth Basketball League is open to all Haddam and Killingworth children in 3rd through 8th grades. All players must attend one of the in-person skills assessments. The fee is $115 / $95 2nd child. There will be a $25 late fee for registrations received after 10/18. Recreation Scholarships are available to for those who qualify. No fee for Head Coach or Referees who ref. at least 6 games (1 child); half-price for Referee Schedulers. We need coaches and referees! No refunds after 10/18; except for illness, injury, or relocation. Refunds will be on a prorated basis. On-line registration now available! Please go to our registration page. Participants must register on-line or by mail before attending the skills assessment. The players will be evaluated by experienced coaches. This is not a tryout. All players who register will be assigned to a team. Please arrive 15 minutes before time slot to check in. Players must be prepared to play (wear sneakers) for the duration of their time slot. Teams: All players will be assigned to a team. Players from last year have been rated by coaches and we will also assess players’ skills at in-person assessment. Players will be assigned to teams by skill level to ensure an even distribution of talent. Children in the same family in the same division will be on the same team. If you have a neighbor who is in the same division as your child we will try to put them on the same team (No Guarantees). Head Coaches carpooling requests will be honored first. Do not request friends to be on the same team. We will only match neighbors for carpooling purposes only. Once teams are formed, it will not be possible to move children to other teams. Fair and balanced teams will be our first priority. Practices: Time and locations of practices are at the discretion of the coaches. Practices are conducted on weekday evenings or on Saturdays and will begin in December. Practices are held at Killingworth Elementary School, Haddam Elementary School, Burr Elementary School, and HK old and new Middle School Gyms. Games: Pre-season and regular season games are played at the gyms listed above on weekday evenings and Saturdays from January 8th – March 3rd. Equipment: Each player receives a team uniform top. Players provide shorts and sneakers. 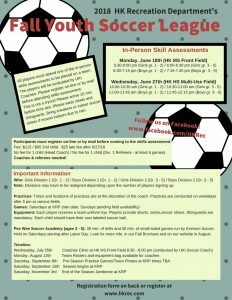 Scheduling Referees: We must have 4 or more parents to help with scheduling referees. The HK Recreation Department will provide a listing of referees; volunteers need only telephone and arrange schedules. The fee for the league will be waived half-price if you help. Skyhawks Basketball Clinics (Gr. K-1) and 2nd Grade Basketball: Please look for information in the Winter brochure. Please review these policies regarding participation in the HK Youth Basketball Program (sponsored by HK Recreation Dept). 1. There will be no refunds issued once registration is completed (after October 18th). Exceptions will be made if a player is ill or injured (doctor’s note required), or if the player moves out of town. Refunds will be pro-rated. 2. It is understood that players are expected to be at their team’s practices and games. 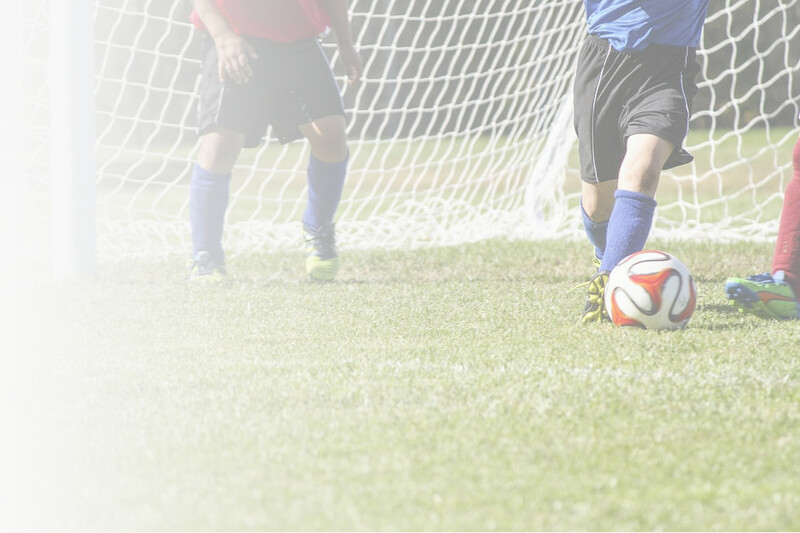 If a player will be late or unable to attend, the coach should be notified beforehand. Non-playing siblings will be supervised by their parents at practices and games. 7. I understand that my child is not allowed to wear any type of jewelry to games and practices. This includes cloth/plastic bracelets and most importantly any PIERCED EARRINGS. Answer: We have practices from 5 – 6:45 pm. 2) Why not have all the games on Saturdays instead of just a few? 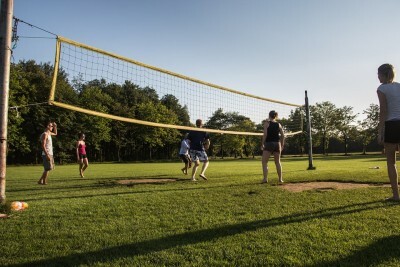 Answer: The Recreation Dept. must pay time and ½ in custodial charges on weekends. There are no charges on weeknights. This is a savings of several thousands of dollars when we limit the number of weekend games. 3) Why wasn’t my carpooling request honored? Answer: Although we try very hard to honor carpooling requests, we are not always able to do so. Teams are put together based on a number of factors. We take “day of the week your child can’t practice” first. Then we look at their skill rating (as rated by last year’s coach and at In-Person Registration), height, & carpooling requests. Our goal is to make fair and balanced teams. Putting all the “best players” in a division on the same team due to carpooling requests is not fair to other teams. 4) Why can’t the players wear earrings or put tape or a Band-Aid over them? Answer: a) For the safety of the players, earrings are not allowed. If a child gets hit in the head with the ball, it can result in a very serious injury. b) We follow HS Basketball rules which strictly forbid jewelry. Thus, the legal ramifications to all concerned are very serious. 5) Why is the score not kept in the Training Division? Answer: This is an instructional league – the focus of this division is to teach the children how to play basketball – not on winning or losing. When we previously kept score in this division, we found that a few good players dominated the scoring, scores were very lopsided, and having a 40-8 game with one player scoring 36 points is disheartening to the players, coaches & parents. 6) Why are there games that have no referee? Answer: Our referees are parent volunteers. We need more parents to help out. Our referees are taken from a very short list. With 30 teams, there are 15 games per week that need to be covered. This is a monumental task when fewer and fewer parents offer to referee each year. Only 3 parent referees attended our Referee Training Clinic! 7) How do we know if a game is canceled due to the weather? Answer: If there is no school or an early dismissal due to snow, there are no games. For weekend cancellations or last minute weather issues – check Ch. 3, 4, or 8. We will try and send out e-mail notifications. PORTLAND MIDDLE SCHOOL (PMS) – Take Arrigoni Bridge (Route 66) across the CT River to Portland; Bear right on Route 66 heading East (toward East Hampton); Go approximately ½ mile and take a left on High Street (Cumberland Farms at the corner); Go up the hill on High Street; approximately ¾ mile on your right is the HS/MS complex. Rt. 81 to Route 9 South; At Exit 7 merge onto Rt. 82 toward East Haddam/Moodus; Turn Left onto Saybrook Rd. (Rt. 154); Turn Right onto Bridge Rd and continue to follow Rt. 81; Keep Left at the fork to go on Rt. 82 (Norwich Rd); Turn Left onto Town St. (Rt. 151); Turn Right onto Joe Williams Rd. #45 is on the Left. CROMWELL MIDDLE SCHOOL (CMS) – Go North on Route 9; Take Exit 18 (Route 99 North);Merge on to Main Street; Go 3 miles and turn left on Geer Street; Go 100 yards and take right on to Raymond Place; Slight left at Capt. James Mann Drive. Take exit 5 off of Rt. 9. At end of exit, take a right. At end of road (Rt. 80) JW will be straight ahead. We will make sure that our child is having fun playing basketball and that he/she is participating because they want too. We will remember that the game is for the children, not for the adults. We will respect the coaches’ decisions and try not to shout personal instructions from the stands during games or practices forcing my child to choose between listening to his/her coach or myself. We will not use or tolerate foul language and will not get into arguments with the opposing team’s parents, coaches or players. We will not come onto the Court for any reason during a game, unless invited by the referee. We will not criticize the referee openly or directly during or after the games. Any criticism shall be done in writing to the HK Recreation Department. We will only give positive feedback to players on both teams. We understand that improper behavior (cursing, fighting, use of alcohol, tobacco or drugs, showing extreme lack of sportsmanship, etc.) at a game or practice may result in that person being asked to leave the gym by the referee, coach, or HK Rec staff. We also realize that any such behavior by us may result in our coach being ejected from the game. We understand that HK Rec. can suspend an individual’s privileges to attend games should we behave in a manner that is rude or otherwise offensive. We will attempt to learn the rules of the game including local league policies. We will help the coach to encourage our child to learn and follow the rules of game and to resolve conflicts without resorting to hostility or violence. We will read and follow the rules posted rules for the facilities we will be using this season and will remember that all school campuses and Youth Sports events are drug, alcohol and tobacco FREE locations and events. We will praise our child for competing fairly and trying hard. We will help our child by pointing out the strong points of their game. We agree to try and have as much fun watching our kids participate as they have playing Basketball!!! Thank you for being a good fan, supportive parent, and a positive role model. Who: Haddam and Killingworth residents only (ages 18-30). Non-Residents who graduated from HK High School are eligible. When: Some games will be played on Wednesdays (some Mondays) at 7:00 pm and 8:30 pm at the HK Old MS Gym January through March. Fee: $85 per player. No refunds. 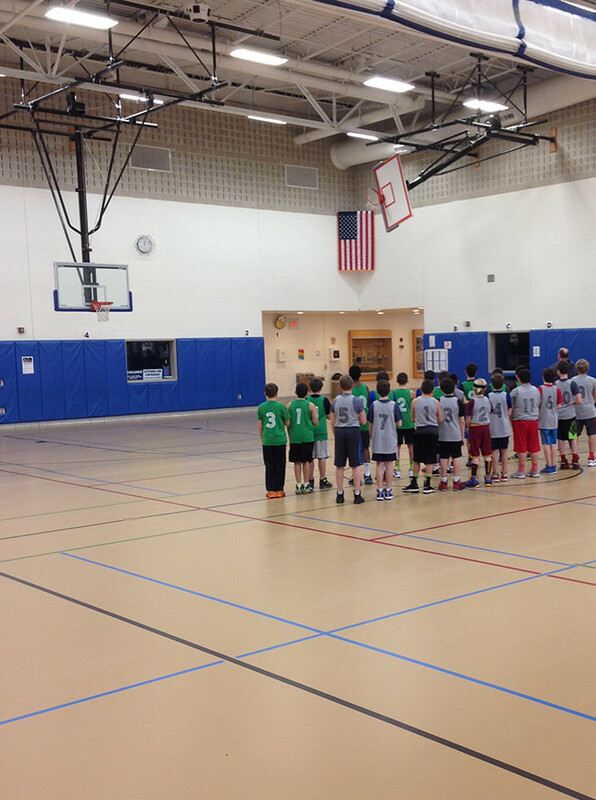 Half-price for any players who will referee at least 6 games in our Youth Basketball League. There will be a player evaluation on Wednesday, December 6th at 7 pm at the OLD MS Gym. Players should bring registration form and payment. No players will be allowed to play in the league until payment is made. How to sign-up: Please mail registration form and fee to the HK Recreation Department, PO Box 569, Higganum, CT 06441 or drop off at the HK Recreation Office mail slot at 91 Little City Rd, Higganum. Registration is also available on-line at www.hkrec.com. There will be a $10 late fee after 12/15/17. For further information, contact the HK Recreation Department at 860-345-8334.
Who: Haddam and Killingworth Residents Only. Must be 30 years of age and older (proof of age and residency required). When: Sundays, 12-4:30 PM and Tuesdays and Thursdays at 8:30 pm. League plays January through April. Where: HK Old MS Gym on Sundays. KES, Old and New MS Gyms on Tuesdays and Thursdays. Fee: $115 per player (plus one time reversible tank top fee of $25); Registration is also available on-line at http://hkrec.recdesk.com/recdeskportal/ (New players must still attend evaluations on 12/2 or 12/9). No refunds. $25 late fee after 12/9. Limit: 1st come, 1st served basis. New players only: New players MUST ATTEND evaluations at the old Middle School Gym on Sunday, December 2nd or 9th from 12-2 PM. Please bring form, check or receipt from on-line payment and proof of age and residency. Come prepared to play in the player draft. Everyone will be assigned to teams based on their skill level. Returning Players From Last Year: Complete a registration form and return it with payment to the HK Recreation Dept., PO Box 569, Higganum, CT 06441 or register on-line by 12/9. Purpose of League: The purpose of the league is to offer informal competition between sportsmen. 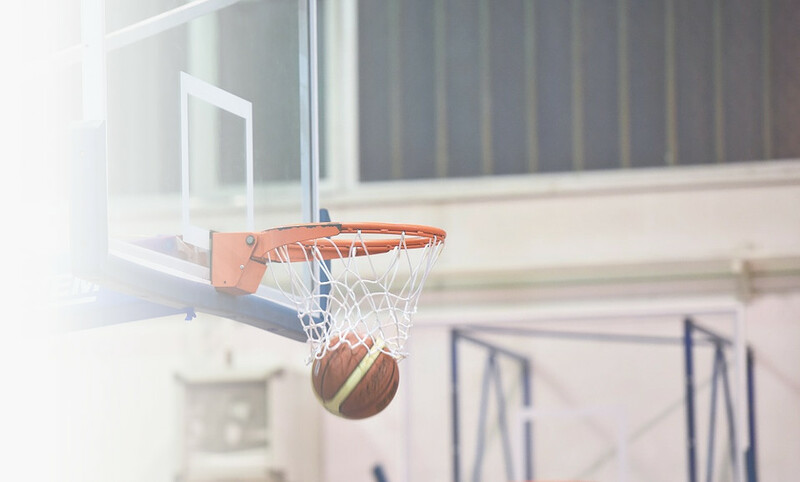 For those who enjoy playing in pick-up basketball games, this league offers an opportunity to play in scheduled games with a scoreboard operator. For further information, contact the Haddam-Killingworth Recreation Department 860-345-8334. League play is on Wednesdays at 7:30 pm at the HK High School Fieldhouse and begins in October. Games begin at 7:30 pm unless noted. In order to view and print the schedules or rules, you must download Acrobat Reader. Bad Weather: Visit the HK Recreation Department website for announcements and cancellations. All Players Must Prove Residency Before the 1st Match They Play In. Bring I.D. To Practice! Rosters Are Frozen After The 6th Week Of Play. All Players Must Sign-In Before Each Match. Team Captains Are Expected To Go Over Rules With Their Players.